Derrick Bopape's rampage at an Mpumalanga school has led to his death after he was shot by police. Picture: Screenshot. Derrick Bopape was shot by police following the incident and has now succumbed to his injuries. Derrick Bopape, the 25-year-old man who was shot by police after going on a rampage at a Mpumalanga school in a video that went viral, has succumbed to his injuries and died at Witbank Hospital in eMalahleni. Bopape’s sister told The Sowetan police had informed the family of her brother’s death. The Independent Police Investigative Directorate (IPID) will be investigating his death and was already looking into the discharging of an officer’s firearm in the incident that led to it, News24 reports. 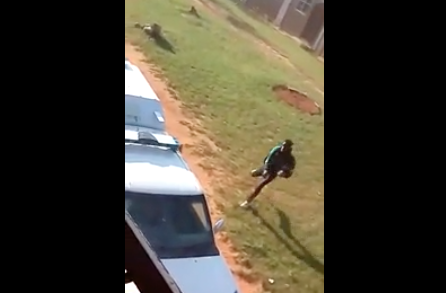 The Mpumalanga department of education condemned the incident where an “intruder” was shot by police officers after he went on a rampage, vandalising buildings at Mmametlake Secondary School, where he also attacked policemen. In a video that has gone viral on social media, the intruder can be seen brazenly smashing windows. When a police van arrives, the man throws objects at it, causing the policemen to temporarily retreat. The man, who was later identified as a former student, is eventually shot and arrested. He is run over by the police, in what appears to be an accident in their attempts to catch him, and is then seen shot by an officer in the video. “The department is concerned about an incident that took place at Mmametlake Secondary School in Dr JS Moroka Local Municipality where an intruder, who is alleged to be a former learner, wanted to see the school principal,” said Mpumalanga education spokesperson Jasper Zwane. “The department will send a team to the school tomorrow [Friday] to investigate the circumstances that may have caused this and to start a process to render counselling to the affected learners and teachers,” said Zwane.